Scrying Eye Games thanks you for deciding to spend your money here instead of somewhere else. Scrying Eye Games (SEG) policies are here to protect not only you, the buyer, but also ourselves. Without you, our games are just junk sitting on a server or on some shelf somewhere, taking up space. We think we've got some pretty good stuff, and we want you to receive the best service and products possible. To provide quality and consistant products to individuals and businesses at economical prices. To excel at maintaining attention to the design elements that the gaming environment requires. To exceed the expectations of the end user by creating a unique and reusable asset for their gaming needs. All personal info we obtain from you is strictly for internal use. With the exception of a court order or similar legal situation, we will not willingly give out your personal information to anyone for any reason. We hate spam as much as anyone. As such, we will only email you if and when it is necessary. This will be for things such as: updates to products, notices of resets for downloads, changes to policies, and changes to the website that would directly effect you as a customer. At this time, we are about to instate a newsletter program. If you wish to change whether you do or do not receive the newsletter, please log in and go to your account settings to make the necessary adjustment. All purchases that are downloadable, electronic format have been moved to RPGNow.com. If you need a copy of something that you purchased from us at an earlier time, contact us HERE from the original email you gave us for that order, and we'll make arrangements for you once we've checked on the order. At this time, there are no "burn to disc" service of any of our products. You assume the ability to download the product upon confirmation of purchase. You also assume any printing costs of any such product, if such services are required to use the product. All purchases are final. There are no refunds based on erroneous purchases. Please make sure that you are ordering the correct item, scale, or format when you place you order. We give permission to archive any purchase you make from us in whatever secure fashion is available to you. CD, DVD, and portable backup drives are common for this. In fact, we strongly support the concept that you should back up all your purchases and other valuable data on a regular basis. The scanning, uploading, and/or distribution of any Scrying Eye Games material via the Internet or via any other means without the written permission of the publisher is illegal, and punishable by law. Please purchase only authorized electronic editions and do not participate in or encourage the electronic piracy of copyrighted materials. Your support of the authors’ rights is appreciated. All orders will be shipped within 5 business days (usually less, but we're being realistic), except during conventions where we will be out of town. All convention appearances will be listed on the front page of the website or on the convention page, so check there first. All shipments will be sent to the address you have provided at the time of your purchase, and it it completely up to you (the buyer) to ensure that this is the correct address. Check the address in your "My Account" setting before making purchase. The downloadable electronic format products are all in PDF format. As such there is no shipping for these items at this time, and it is up to you, the purchaser, to be capable of downloading the products yourself. You may use any of our mapping or miniatures products for personal use only. We extend "personal use" to include running games and demos in a public environment, such as at local game stores and conventions. You may not reproduce or share any of our products for any commercial purpose without specific, written permission from Scrying Eye Games. You are allowed to print and/or reproduce any Scrying Eye Games PDF printable product for personal use, to be used under the same guidelines as stated above. To ensure that there is no confusion at your local print shop, this is clearly stated on the credits page of each and every single product we produce. We support all FLGS (Friendly Local Game Stores), and will sell wholesale direct to you.. If you have a retail store, contact us thru the Contact Us form (below) with your store name, phone number, and website address (if you have one), and we'll be happy to call you for further information. UPDATE: We now have a Retailer's Order Page, so you can order direct at any time. Contact us for more information. 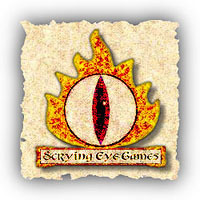 Scrying Eye Games will no longer do custom work, custom maps, illustrations or printing for any individual or company.